What could you do with an extra R10,000 or a $1,000 a month? Having a side hustle has become more relevant and frequent in recent years than ever before! It always amazes me how many of my clients, past colleagues and close associates all have a side hustle that I would never have known about if I didn’t know them outside of the corporate world. The challenge is, it is mostly men who venture beyond their day jobs for extra income. It seems like us women suffer from the “good girl” syndrome – being loyal to a company or a job at all costs. Here, we explore three reasons why you should start a side hustle. Lesson 3: you never know – your side income may replace your day job! What could you do with an extra R10,000 or a $1,000? Just Dream. It just comes down to how badly do you want it? If you enjoyed this podcast, we suggest listening to 6 ways to make money sitting your couch and 3 ways to nail your business or second income idea. Hello everybody, and welcome to today’s episode of Working Women’s Wealth. This is the start of a theme we’re going to be following for a while, which is on earning a second income. And whether you want to call that a side hustle, following your passion, getting yourself to financial freedom earlier, whatever you want to call it, that’s our series. One of the things that has always amazed me when I went on my own, is how many of my ex-colleagues in corporate had another job, a little side hustle. Whether it was a physical business, such as a kitchen cabinetry making business or an Uber car or two or whether it’s a digital business such as some form of online blog or online teaching thing, it always amazed me that there was this whole other life that was going on that I actually didn’t know about in the corporate world. So when I started advising them about their money and set up my wealth management business, obviously the source of income came out. It really was a great chat and a great conversation to find out more about what each one of them did. The challenge that I found was that it was mostly men. I don’t have many women clients who have a side hustle, a few. One of my clients has a beauty shop on the side, so in her corporate day, she has a manager who manages her beauty shop. But it really struck me how many of the women did not have another income. I put it down to that “good girl syndrome,” that we must all be good girls, go to work, give our souls for this job, work 12 hours a day, and also try and juggle our family and our lives. Yet men don’t seem to have that problem at all. They give their eight hours, which is what they’re paid for, and the rest they give to their side hustle. And it’s a fair trade. They are only paid for eight hours, like we are as women. But their businesses are never in the same line as their main job. And that’s one of the things that I really think is interesting, is that for most companies, they have non-compete clause. You may not earn another income from something that competes. You can earn it from a rental flat, you can earn it from anything else, but you can’t have something that competes directly. And I remember this clearly from when I worked in a bank, is that we had to disclose other sources of income. And each year, I would disclose that I had a flat, and so I had rental income. I don’t think corporates mind so long as you’re not starting up in complete opposition with your day job somewhere else. 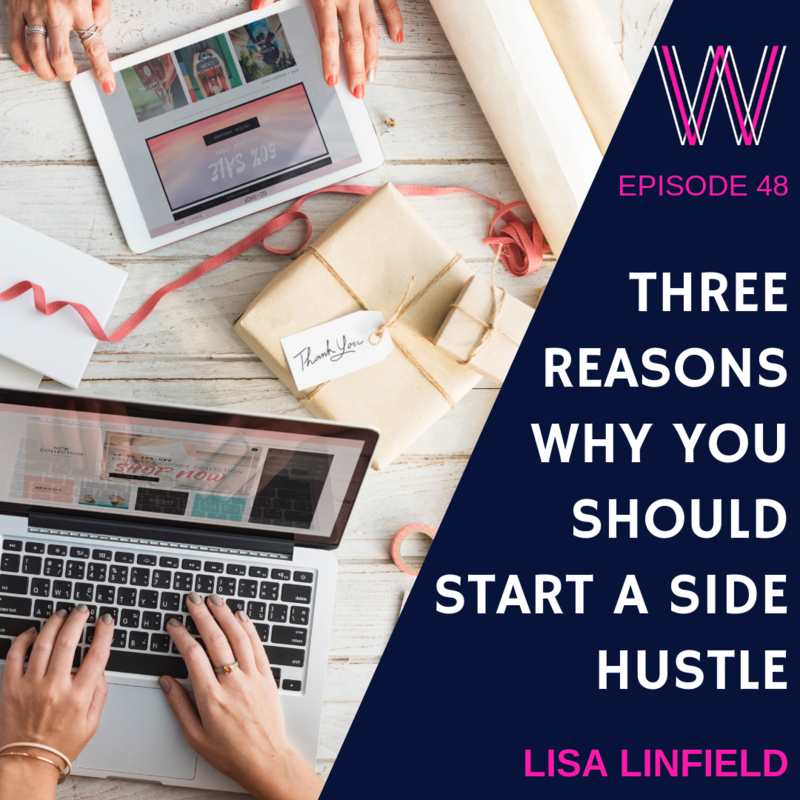 So for those of you that are employees and are thinking of starting a side hustle, or haven’t even let the thought cross your mind, I wanted to give you three reasons why you should be considering earning another income. The first reason is that the only job security you will ever have is the one that you’re in control of. And it’s really important to know that no matter how good you are at your job, there is no guarantee that it’ll be there for you tomorrow. In the corporate world, I was on both sides of the fence. I have both been made redundant, and I’ve also made others redundant or retrenched them. I was made redundant in both of my pregnancies. In my first pregnancy, it was because the business restructured, and I was the sales director of a multiple of different businesses. And then when the business restructured and those businesses stood as separate entities, there was no reason for me to coordinate the sales between each one of those separate businesses. In my second pregnancy with my twins, my job was taken away from me because I was running a 3 billion Rand business, and they believed that I was unable to do this whilst still needing to take extra maternity leave, because I had a complicated pregnancy. So they gave my job to someone else. And again, neither of these circumstances were anything that I could control, but were both outcomes that are likely to hit anybody, or could hit anybody at any stage. When you run your own business, you have more control over your position. Yes, the market changes and customers do too. But really, it’s up to you to pivot, to do something different to respond to the changing needs. And it’s all within your control. You also have more influence over your income. Whenever I talk to couples who are short of cash, the person who is usually able to come up with creative solutions is the one that’s not in a paid salary business. The person who has the salary really struggles, because they’re given a fixed amount. Yes, they may be able to negotiate a higher income from their bosses, but the reality is, they don’t have the flexibility to switch on and switch off income streams. And when you have your own business, you can. You can create your own financial security. The second reason is that financial freedom comes quicker when you add to your income. You can absolutely work to cut your expenses to help speed up your financial freedom. But there really is another option, which is increasing income. So many times when I look at people’s budgets and their income and expenses, I deeply believe that they cannot save more money, that they aren’t really wasting any money. You know, it’s not that whole thing of, “Well, if I cut down a cappuccino … ” For many people, they’re not drinking the cappuccinos. They’re packing their lunches, taking it to work, and trying to survive on the income they have. So for them, it often is a case where I suggest to them that they need to get a side hustle, and they need to make some more income. And what really interests me, is how much of a shock it is. How much it hasn’t even struck people’s thought processes that you could do an additional job on top of your nine to five. And I think there are many reasons for it. The first one, I think, is that for most of us, we didn’t grow up seeing this example of a side hustle. We watched our parents have corporate jobs and come home, and mostly it was our dads. And they’d come home, and the food would be on the table, and we’d all sit round the dinner table and eat dinner. But our parents had a lot more job security. I think that it innately feels abnormal for those of us who didn’t come home and see dad working on a different business or mom working on a different business. But I also think that there’s a second element, which is because it’s never crossed many people’s minds, because as good girls we are loyal to the company we’re with, I also think there is an instinctive reaction, which is, “How would I get another job? When would I do this other job? What would I do?” Because we all think of a job as a physical place where we go to work. So I always recommend that people read … there’s a blog that I wrote called Six Ways to Make Money Sitting on the Couch. 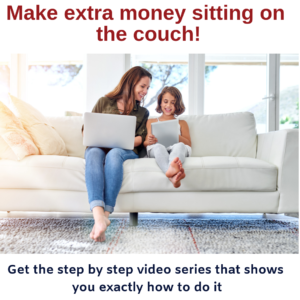 And the reason why, is that it really is a mindset shift when I discuss with them that you actually can make money in addition to your income while sitting on the couch. In my fifth episode, I interviewed the entrepreneur, Jane . And she was telling us about her three businesses that she ran, and then she and her partners decided to set up two more and were unable to draw money from the business, because they had all committed to not take a salary. But she wanted to go to Greece. And so, she read my blog article, and one of the ways to make money is to test websites. And so, she did this and earned extra income. And she was on track to earn enough money to go overseas. This was a person who already owned three businesses. And so, it’s hugely important when I talk to people, that their mindset opens to the fact that you don’t actually have to go to another job. You can do stuff while sitting on your couch, and that that money can then add to your financial freedom. It always amazes me that once you open your mind to it, how your brain can find opportunities. It’s scientific. There’s a part of your brain called the reticular activating system, and its entire job is to seek out opportunities. It comes from the old days, where you would be walking around and your brain would subconsciously be finding opportunities for food or shelter or something to make your life easier. And it still does it even now. The third reason is that you really never know, there might be an opportunity for your side income to replace your day job. 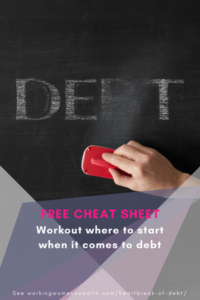 For many people, they just start out with the aim of making enough money to either invest for their future or to get out of debt or to pay for the holiday they would really like. And so, what happens is that they start a little side gig, and it starts to grow, especially if you’re doing something that you’re passionate about. I really know that for most people, that investing their time to do website testing or usability testing is not exactly a passion, but a means to an end. But if you do start to do something that you’re passionate about doing, it really often amazes people how they can grow their business on the side, and one day it can become their main focus. For me, Working Women’s Wealth is my side gig. So I have a wealth management business called Southern Pride Wealth. But Working Woman’s Wealth is my side gig. And it’s born out of a passion and a purpose to teach a million women about money. Because it’s such a huge goal, it forced me to think creatively on different ways that I could do this. Again, that part of my brain was activated to try and find reasons how and why and where I could teach people without having to do it in person. I find myself having launched a podcast, which was never on my radar, creating online training courses at the moment, which I had never considered. But I love it so much, and it’s something that I really get so much energy out of doing, that it less and less feels like work and more and more feels exciting to find different ways to do online marketing, to find different ways to build courses, to find different ways to grow my tribe. The other day I did my first Instagram Story, and I kind of felt like a little child having discovered a new toy. I love my wealth management business, but I’m passionate about teaching people to manage their wealth themselves, to give that “aha moment.” When people SMS me or send me an email or comment on my blog post that something I have said has really given them an “aha moment” that’s changed their wealth, is for me one of the greatest things that I can do. So I really want to leave you with a question. What could you do with an 10,000 Rand or $1,000? Dream. Just dream. And then I want to tell you that you can have it. It just comes back to that question that I often say, “How badly do you want it?” Open your heart and your mind to finding different ways to create other sources of income. Get in control of those dreams that you have. It’s doable. I’m doing it, so anybody, trust me, anybody can do it. Have a great day. I’m Lisa Linfield, and this is Working Women’s Wealth.